I received an ARC from the author for the purpose of an honest review. I read episode one of My Master’s Nightmare in one sitting. This fact alone should be enough to show other reader’s how well it held my attention. Rita’s husband is killed by an Italian mob boss, one who traffics human flesh against their will, mainly beautiful woman. These young unfortunate souls are broken down, humiliated, and then molded into the perfect slaves for top-dollar clients. Rita Kovak, an FBI agent, offers herself up as bait, hoping she will be brought in close to the man who killed her husband. But things are not always what one sees on the surface and Rita can’t be certain the man who abducts her isn’t also a victim in this organization. In this first episode we are introduced to Rita as she is set up to be abducted. We learn why she is there and about her plans to bring the mob boss down. But we also learn more about her as a person, especially when she is forced to face one nightmare ordeal after another at the hands of these cruel men. The pace is lightning fast. I found absolutely zero areas where I grew bored or felt tempted to skim and became totally involved in Rita’s predicament. I’m left hoping she will find a way to win against the astronomical odds set against her. The cliffhanger ending of episode one left me chewing on already ragged nails, anxious to learn what horrors she will face next. I only hope I don’t have to wait too long. 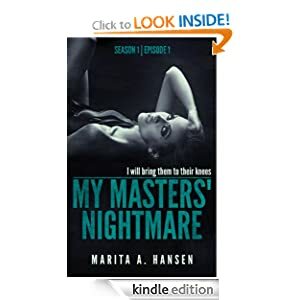 My Master’s Nightmare, a great start from talented author Marita Hansen for what looks to be a thrilling new serious. Posted by Denna Holm on October 11, 2013 in Archives.